If you have always dreamed of turning your passion for racing into your job, here’s the chance to do so! 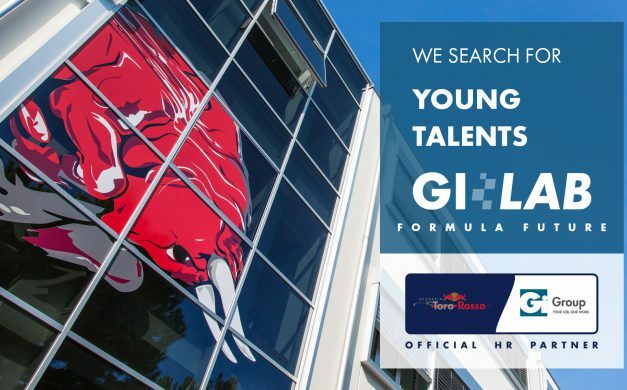 Gi Group and Scuderia Toro Rosso started the search for talented young people with Gi Lab – Formula Future, a series of 10 training courses aimed at building some of the most professional figures involved in the Formula 1 World Championship. Each of the ten courses of the project is aimed at specific fields of expertise. The “Learning by Doing” approach combines theoretical and practical lessons to staff being chosen and trained in the Technical and Industrial areas of the Scuderia Toro Rosso factory in Faenza. The structure of the courses has been designed for the formation of highly specialized technical figures for undergraduates in Engineering in one of the following disciplines: Mechanical and Composite Design Engineer, R&D Test Engineer, Computational Fluid Dynamics (CFD) Engineer, Vehicle Performance Engineer, Electronics Engineer, Production Project Manager and Buyer. The requirements for submitting the application to the Gi Lab – Formula Future are: technical diploma or degree in Engineering (mechanics, vehicle dynamics, aerospace), good knowledge of English, passion for the Automotive and Motorsport sectors in general, and It is welcome – though clearly not mandatory – a brief background experience in the industry. Last year, of the 28 students selected, when the course was finished, 20 of them were taken on by the company. This year, we hope to replicate the success and to promote the growth of young, highly engineered minds. June 30 marks the deadline for the selection of young engineers. To submit your application, just follow this link.